China's CCTV broadcasts its first-ever series on Jewish history and Israel. China's CCTV has launched its first-ever series on Jewish history and Israel. The series, a documentary, is titled "Walk into Israel – The Land of Milk and Honey." 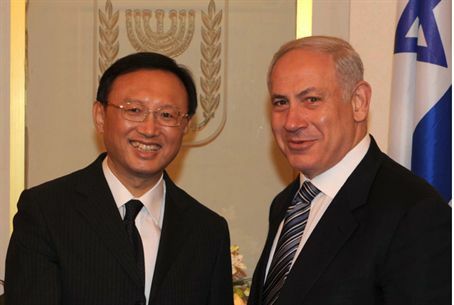 "Walk into Israel" was launched at an event in Beijing covered by the People's Daily Online. "Through this amazing program, which explores and unveils the wonders of the state of Israel and the contributions of Jewish civilization to the world, we are now able to present the real and bountiful Israel to the Chinese people,” Kivetz enthused. Ties between Israel and China were virtually non-existent prior to the 1980s due to China's support for the Muslim world and the Palestinian Liberation Organization (PLO). The two nations developed military ties in the 1980s, and formally established diplomatic ties in the early 1990s. Trade between the countries has since surpassed $4 billion per year. Some senior Israeli leaders have ties to China. Former Israeli Prime Minister Ehud Olmert was born to parents who survived the Holocaust after fleeing to China, and Commander of the Israel Navy Eli Marom is descended from a Chinese convert.